Nicola Piovani (born 26 May 1946) is an Italian light-classical musician, theater and film score composer, and winner of the 1998 Best Original Dramatic Score Oscar for the score of the Roberto Benigni film La Vita è bella, better known to English-speaking audiences as Life Is Beautiful. 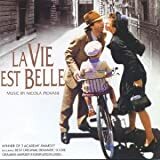 In 2000 his Academy Award-winning score for La Vita è bella (Life Is Beautiful) was further nominated for a Grammy Award in the "Best Instrumental Composition Written for a Motion Picture, Television or Other Visual Media" category, losing to Randy Newman. In 2005 he was a member of the jury at the 27th Moscow International Film Festival. In light of his recent work with French directors, notably Danièle Thompson, Philippe Lioret, and Éric-Emmanuel Schmitt, the French Minister of Culture gave him the title of Chevalier (Knight) of the Ordre des Arts et des Lettres on 21 May 2008 at the Cannes Film Festival. To date, Piovani has over 130 film scores to his credit, including films such as Slap the Monster on Page One (1972), The Perfume of the Lady in Black (1974), Flavia the Heretic (1974), Le Orme (1975), A Leap in the Dark (1980) The Night of the Shooting Stars (1982), and "Kaos" (1984). The music for the latter is considered by many as one of the best film scores ever done. However, he is reported to believe that "Too many film scores make a composer a hack, but in the theatre music is above all craftsmanship". Accordingly, he continues to work in musical theatre, and also composes concert and chamber music.